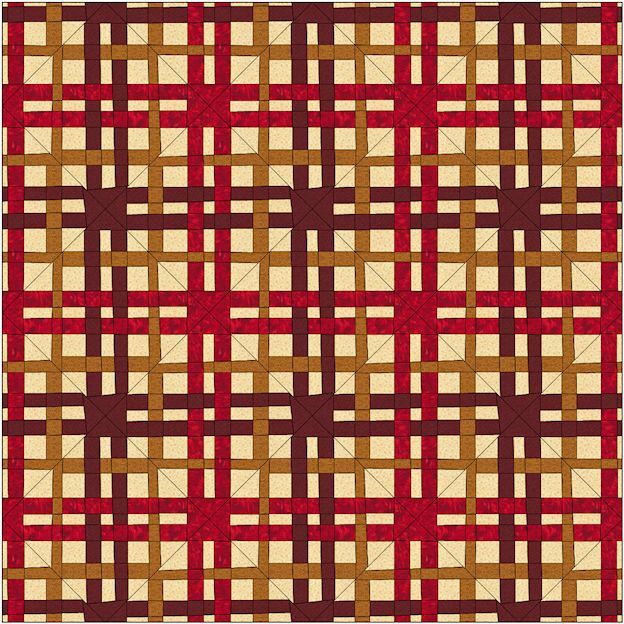 BLOCK 728 : foundation pieced, RED BLACK and CELTIC, page 36, by Moira Mc Spadden . . . 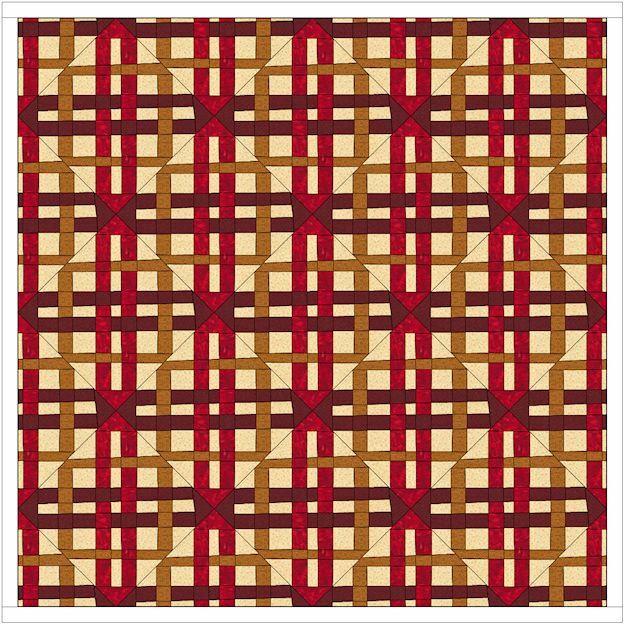 I like this block as I like woven block that go in and out. This is a foundation block that has three templates on the pattern pull out in the magazine. 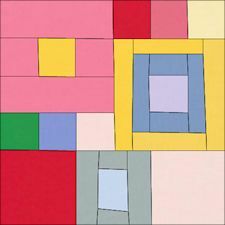 You need to make four quadrants to make the completed 12 inch block. I really like the straight layouts that result in a diagonal quilt. I was surprised that the on point layout resulted in a vertical / horizontal look. I should have expected it but I did not. By alternate twisting of the block placement the corners showed a hour glass corner in the secondary design. I like that a lot. 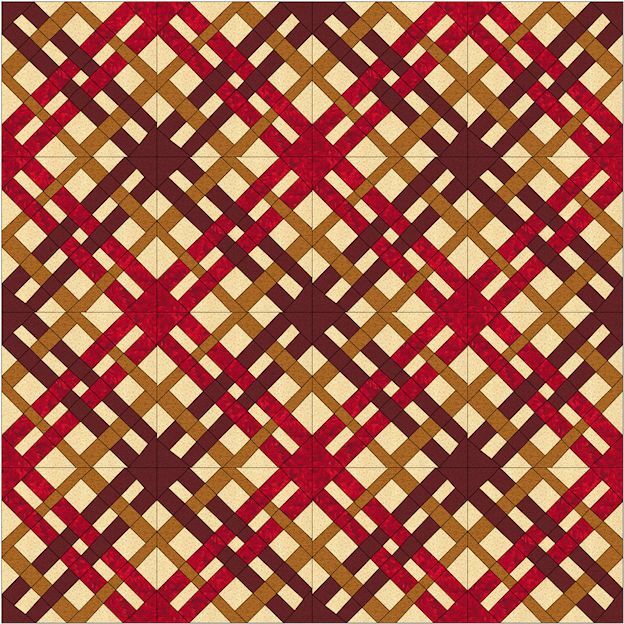 I do not think I would do a quilt with this many foundation pieced units… maybe for a baby quilt but not for a adult bed size quilt…. UNLESS I REALLY LOVED THE PERSON A LOT. I am into really easy, fast, very graphic quilts lately that allow fabric to be shown off. I will have to think about that AFTER I FINISH my current batch of UFOs. I hope you are enjoying these block drafts as much as I am when I make them. I plan to do a few more of them this week. HERE is another block I have been playing with. 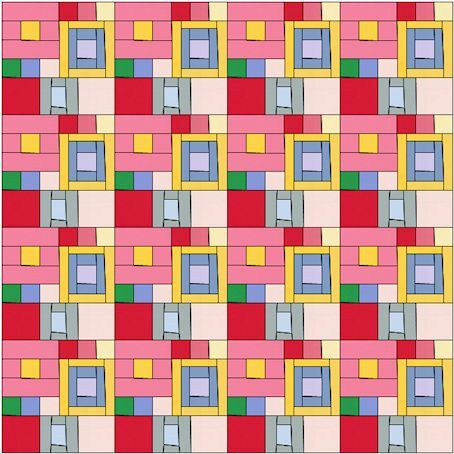 I drafted the original block by measuring the foundation provided in the magazine QUILTMAKER’S 100 BLOCK. series 7. In the modified version I increased the number of wedges and decreased the size of them. I did this as I have tons of scraps I could use but they are narrower than what the original pattern called for. I was really surprized how this block looks on point. PLAYING IN EQ 7 …. DRAFTING BLOCKS from QM 100 magazine. I just got the QUILTMAKER’S 100 BLOCK book series 7 magazine. This is one of my favorite magazines because it gives you so many design inspirations. 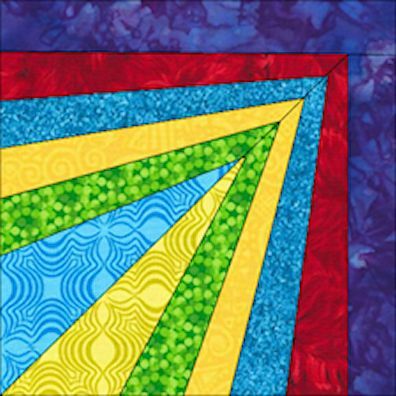 I have noticed they are now using blocks not from the average home quilt maker but using more blocks from the QUILTING DIVAs those mavens who are in the quilting business as teachers, designers and authors. As much as I love the QUILT DIVAs I hope QUILTMAKER magazine does not go to far in using professionals. The thing I liked most was the knowledge that these quilt blocks were designed by home quilters not in the business. Bloggers are okay because they were mainly living their lives at home, raising kids, dealing with jobs and family. In other words people like me. 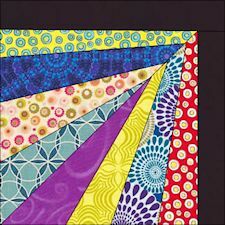 As I do when I get QUILTMAKER’S 100 BLOCK magazine I go to EQ7 and draft out the blocks that tickle my fancy. The one complaint I have about this magazine is that there are very few pictures of quilts made with the blocks shown. The magazine is getting better about this and they do release a magazine with quilts made from the blocks a couple of months after the release of the block magazine, but I am not waiting for that. Besides it is fun to use my EQ7 to draft out the blocks. 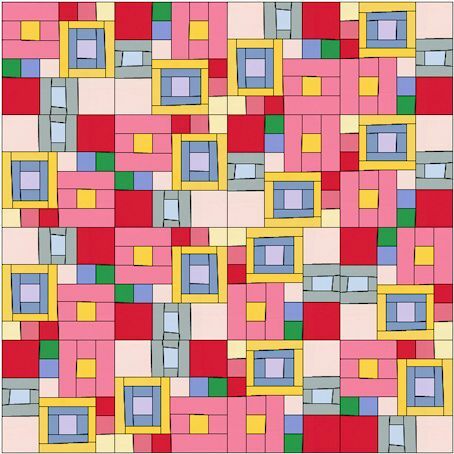 I will say I have not made any quilts from the blocks, probably because I have too many of my own designed projects in progress. Until those quilts are made I am not going to take on any new projects. I really like the on-point version of this block. 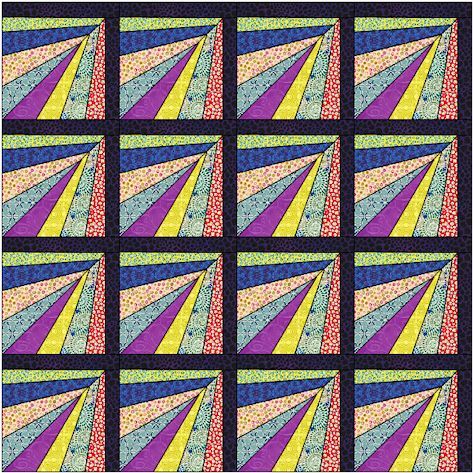 I can kind of see this as a very scrappy quilt… using all the scraps I have in my scrap bin… OH YEAH! 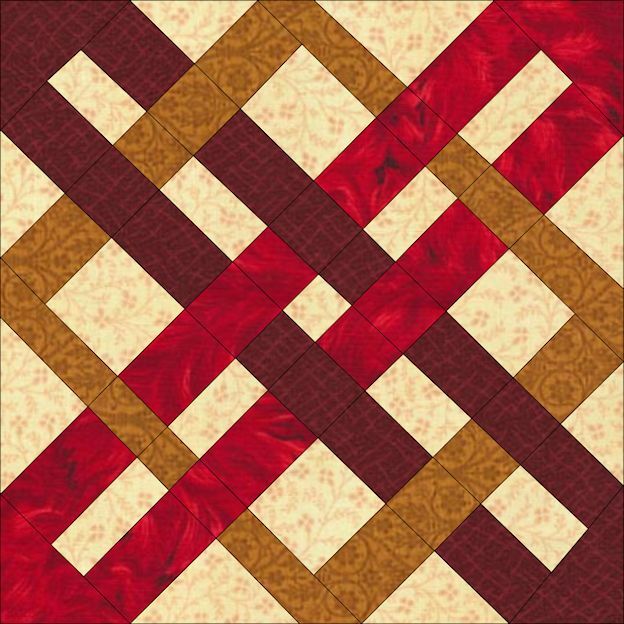 I will post more pictures of my drafts as I create them… maybe they will inspire you… especially if you see what can be done with the blocks placed in a quilt. Well I am sitting in the dark writing a blog post on my lap top… thankfully fully charged. The weather is bad with rain and high winds which means once again the electricity is out. I have learned from experience that my computer can go several hours as long as I do not use high energy programs. Writing is one of the programs that uses the least amount of energy. I had planned to sew all day but a downed wire somewhere seems to have taken care of that plan. When the electricity went out I did the sensible thing and got in my car and went to the movies.. . . .Then I went shopping. My grandson told me he wants a minion hat so I had downloaded,before the power went out, several versions from the internet…. One sewn pattern, one knitting and one crocheted. I am planning to make them all. I will probably make some extra if they work out okay for the little cousins. It has been a while since I have either blogged or podcasted, in part because LIFE GETS IN THE WAY of whatever I plan. The spirit is willing but the flesh is weak. The other reasons have been technical difficulties as my expensive microphone is broken… ( I wonder how that happen… hmmmm NEE-NEE) I have been using some headset mics but I do not care for the sound quality and they require more editing because they pick up my breathing and extraneous sounds. So I have to spend more time editing. As for sewing I am working on a quilt for my husband. 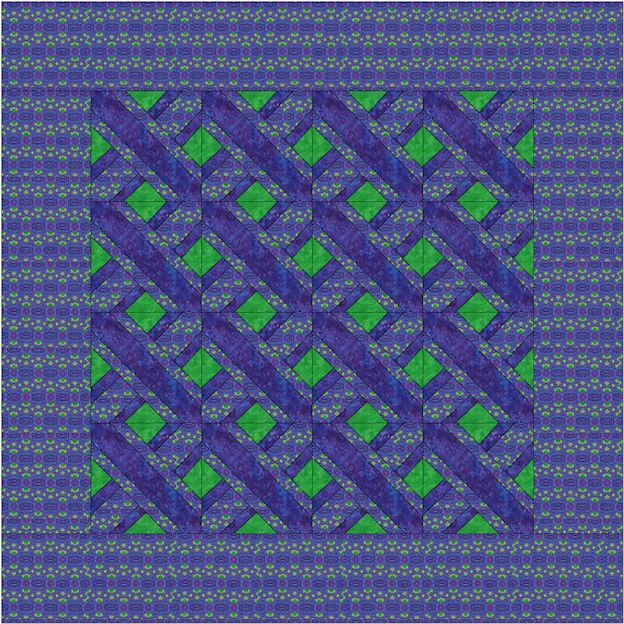 The pattern is from a CRAFTSY CLASS with Camille Roskelley . It was a lovely class but of course I have not followed the pattern … Why do you ask? BESIDES THE FACT I NEVER FOLLOW DIRECTIONS …. The pattern calls for 10 inch layer cakes of which I had none. 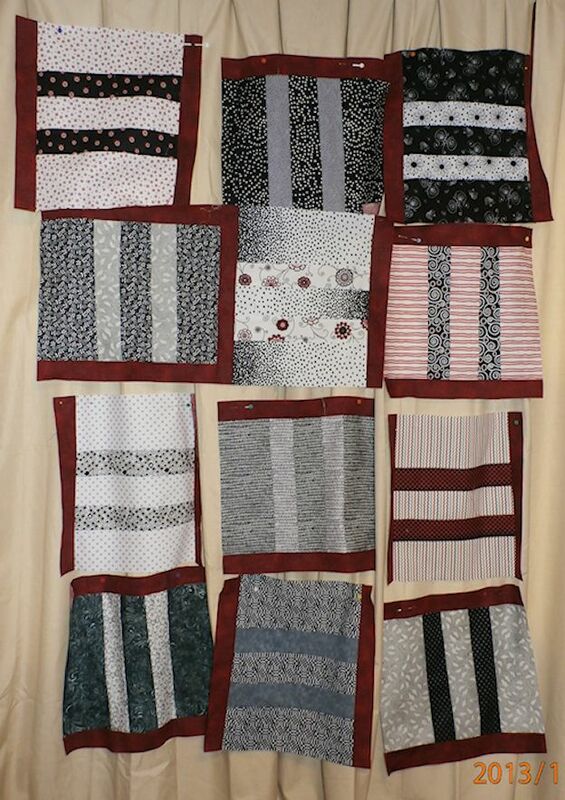 But I did have tons of 12 inch square fabrics left over from another project AND Carole Wolfe shared some of her black and white fabrics from her collection. She sent me 36 twelve inch squares. So between her donations and what I had I only had to buy 12 fat quarters to add to the quilt and that was because I needed to add some contrast and I had more dark fabrics then lights. By that I mean I had more black background fabrics then fabrics that read white with black on it. As it stands I had made over 90 blocks but only used 64 of those for my king size quilt. The rest of them will to into a sofa throw. We really need one bad, because we usually argue over the one we have during the winter time. I do not know why but I found that despite all the patches being the same size ( supposedly 12 inches. )before dissection. The patches being divided to the same size. Using the same consistent seam allowance. Using meticulous pressing technique. My blocks were off size by 1/8th to 1/4 inch. Some were smaller and some were larger. I am not sure what I was doing wrong. I inspected my seams to see if my seam allowance was incorrect but they were pretty much dead on. I am thinking the fabrics might not have been cut to an exact 12inches to start with. Carol’s had measured out okay, but I had my girlfriend help me cut the fabric for a previous project and I did not bother to recheck those patches. I am thinking they might have been off. I did not check every patch as they came out of the storage box I had them in. I did end up modifying the entire pattern. I still used the 2-1/2 inch inserts of contrasting fabric, but I adjusted my cutting of the 12 inch block so it compensated for the change is size. Once I sewed the block back together I ended up with blocks 12 inch x 15 inches. I cut my sashing 2-1/4 inches sewed them on then squared the blocks to 15 inches. They were slightly big but they were easy to square up. 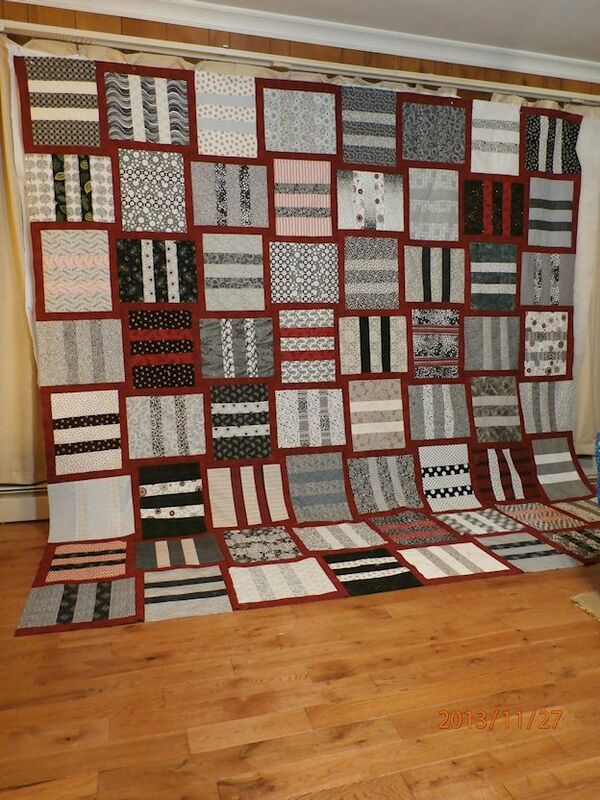 Having squared up blocks to 15 inches square making them the exact size is making this quilt a joy to assemble. 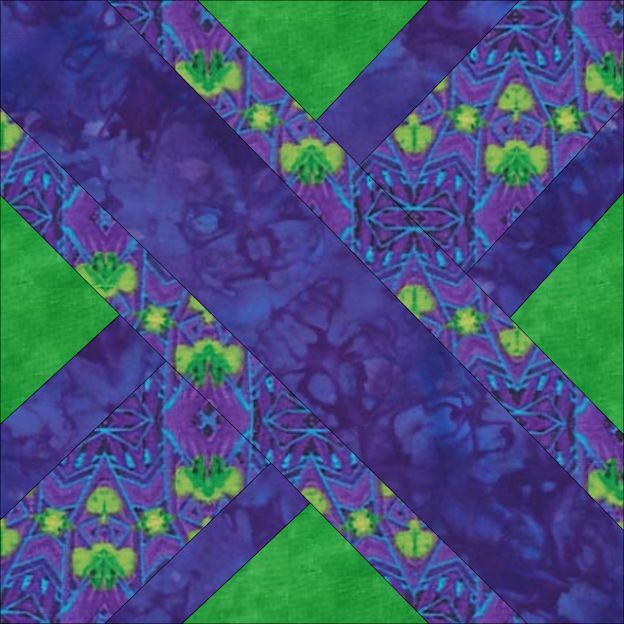 I did do some experimenting while making this quilt. At a CHARITY SEWING EVENT I went to one of the ladies was a proponent of TEARING fabric strips. She said it was faster and more accurate. I did not do it at the event but when cutting my sashing strips I tried tearing some of them to see if it made any difference. Here is what I determined. 1/ Tearing the strips left them ragged and prone to raveling. 2./ I also saw damage that extended deep into the seam allowance. 3./ THE strips themselves warped and were distorted out of straight. I had to starch them back into shape which required more time. 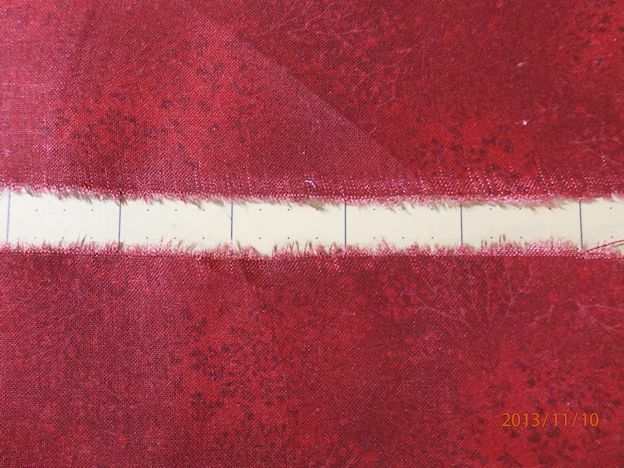 4./ Cutting the strips might take me a little longer but resulted in less work in the long run. WELL the quilt top is assembled. It has taken me 16 hours ( none consecutive) to get to the assembled top. There were many delays during assembling of the blocks. This quilt has been hanging on my improvised design all for weeks. But it is assembled all I have to do is trim strings. I am taking it to a long armer to quilt only in the sashing. 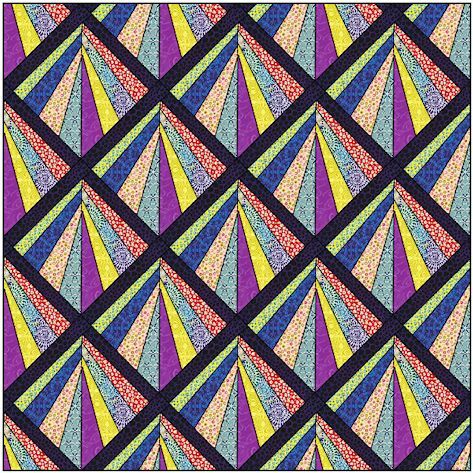 I then plan to free motion quilt in the blocks themselves. I want to do this for two reasons. 1. / It will keep the long arming cost down. 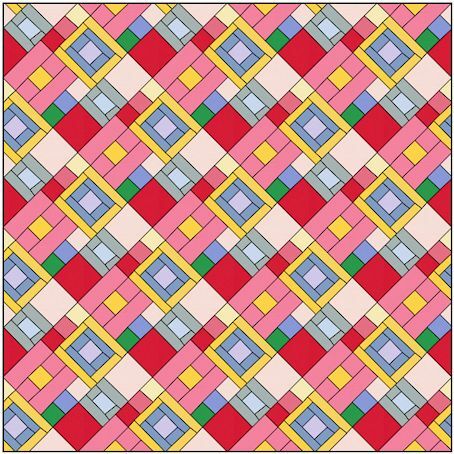 2/ I want to do as much of the free motion quilting as I can since this quilt will be for our bed a gift for my husband.